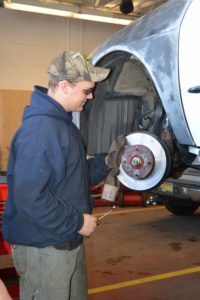 The Auto Mechanics program provides students an opportunity to develop skills, knowledge, self-confidence, and work attitudes. 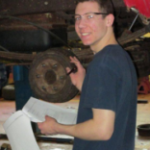 Students apply classroom knowledge in the auto mechanics shop. The course is NATEF/ASE Certified and is designed as a two year program sequence.Students may work in the trade as apprentices while enrolled. The scope of the program allows students to study at a college level as well as provide employment skills training. Second year students may compete in the Ford/AAA troubleshooting contest and are eligible to take the State Inspection licensing exam. Articulation agreements with CMCC and SMCC are in place. Anthony Scenna and Jason Hussey from the Auto Mechanics Program competed in the 2012 Ford/AAA Student Auto Skills State Hands-On Competition on May 12, 2012.